Let’s assume that, as in the previous two blog posts, Jesus told his followers to obey the Shema (“Hear, O Israel…” Deuteronomy 6:4-9) and treat all “the children of thy people” well and “love thy neighbour as thyself” (Leviticus 19:18). One question that arose was, Who is my neighbor? The uncertain boundary for Jesus appears to be the Samaritans – followers of a slightly different version of Mosaic Law, and without loyalties to Jerusalem or its Temple. Not Jews exactly, but almost… and living in the Jewish heartland, halfway between Jerusalem and Galilee, so that Jews and Samaritans inevitably went through each other’s territories. Although the Samaritans were not receptive to Jesus’ focus on the Temple at Jerusalem, he considered a charitable Samaritan to be closer to God than an uncharitable Jewish priest or Levite. In some ways, the Samaritans appear to be in a very similar position to the Palestinians of today – monotheists, claiming descent from Abraham, respecting the Torah but following slightly different traditions, with their own non-Jewish holy sites, and with a historical right to live where they live, regardless of what Jewish fanatics think. 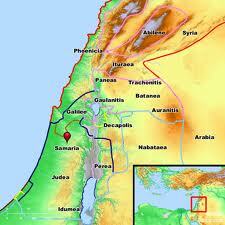 And in fact, some of the Palestinians of today are Samaritans. Some 700 live at Mount Gerizim and in Tel Aviv. Mount Gerizem, West Bank, April 19, 2008. 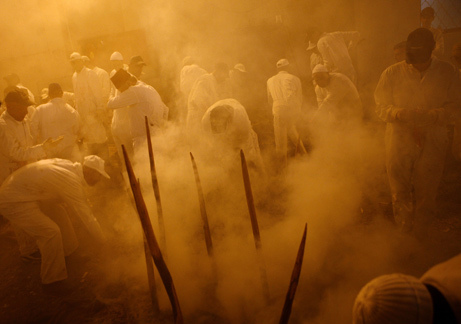 Samaritans gather around fire pits as sacrificed sheep smolder during a ritual of Passover, the annual Jewish holiday marking the liberation of Hebrews from slavery in ancient Egypt. This entry was posted in Religion, Society and tagged Jesus, Jews, neighbors, Palestinians, Samaria, Samaritans, Shema, Temple.